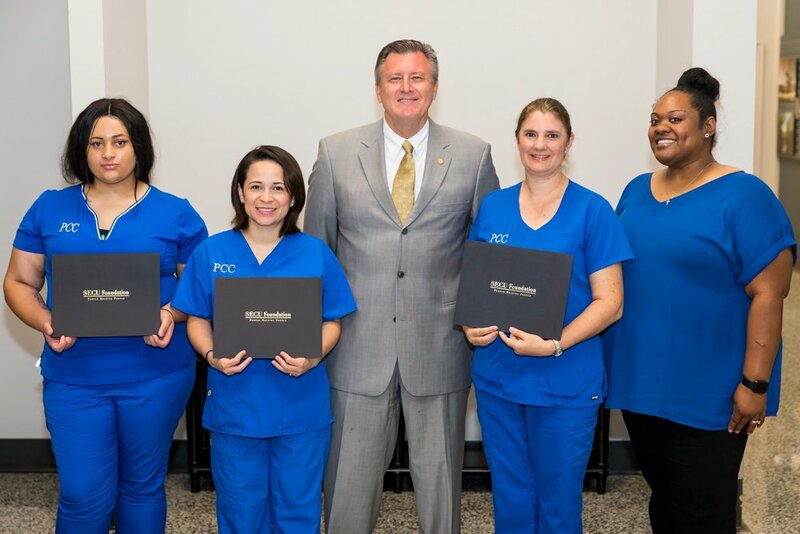 WINTERVILLE—Three Pitt Community College students have been awarded State Employees’ Credit Union (SECU) Continuing Education Scholarships that will help them pursue additional health care training. On Monday, Kerri Brooks, Xiomary (SEE’-oh-mahr-ee) Casias and Monique Rascoe received $750-scholarships from the SECU Foundation that will help cover a variety of educational expenses, including tuition, books and fees, as they further their training. Sidette Brown, PCC Director of Continuing Education Health Care Programs, says the college is thankful the SECU Foundation sees the value in supporting Pitt students through scholarships. Their assistance, she says, will have a direct effect on development of a skilled workforce in Pitt County. Brooks, who says she originally sought nurse aide training to care for her mother, finished the NAI program at PCC last fall. A Grifton resident, she works in an assisted living facility in town and also provides in-home care to an individual with dementia. Though unsure at the moment, she says she is considering enrollment in the college’s NAII program. Casias is a Greenville resident and graduate of South Central High School. She came to PCC as a participant in the college’s VISIONS Career Development and Scholarship Program and graduated from the University Transfer program in 2009 before moving on to East Carolina University and completing a bachelor’s degree in Family and Community Services. Casias says she is now pursuing a career as a registered nurse and is working to complete the prerequisites needed for admission to Pitt’s Associate Degree Nursing program. A Williamston resident, Rascoe completed the NAI program at PCC and is planning to enroll in NAII training at the college in the spring. She works in a Greenville senior living facility and has made it her goal to earn an associate degree and become a registered nurse. Started in 2013, SECU’s Continuing Education Scholarship program is designed to help meet the needs of North Carolina’s unemployed and underemployed citizens. The program assists individuals seeking short-term training for new careers or retraining to advance their current job skills through continuing education courses offered by the state’s 58 community colleges.